I'd like to thank Simon at Low End Theory for his blog .I've referenced his blog for westside taco trucks and it has been an invaluable resource. 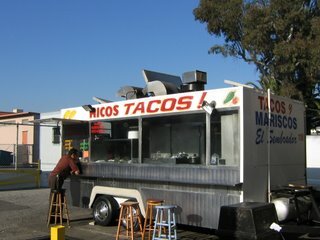 It's how I found the taco truck at Palms market on motor ave as well as several other taco destinations. 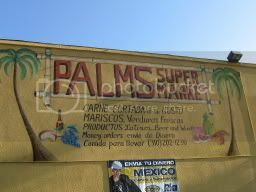 Palms market is a great neighborhood market with a fresh produce section and a carniceria. 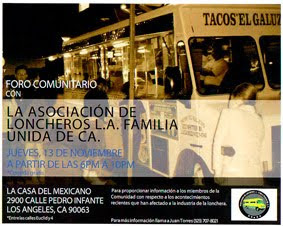 They also have a taco truck they pull out on the weekday afternoons and weekends called El Sembrador. So after buying some carnes,chiles and tomatillos I walked out to the parking lot where the taco truck is parked and handed the lady my ticket. Ticket you say? Yeah I'm pretty cool...I asked the cashier about the taco truck when I was paying for my items and she said that I could pay her for the tacos. I didn't really know what I wanted so I thought to myself for a moment then said I'd like two al pastor and one asada. She looked me over for a few seconds then wrote the number three on a piece of paper "give this to the truck mijo" I felt like a dork for breaking it down to what I wanted instead of just saying how many I wanted. So I walked up to the truck and handed the lady my ticket with the #3 on it but instead of saying two al pastor and one asada I flipped it around to two asada and one al pastor. She paused for a moment and for a second I thought she might pick up a walkie talkie and say "this gringo is playing games" but she smiled and started to prepare my tacos. When my tacos came the first thing I noticed was the lettuce. I'm not a fan of lettuce on soft tacos because it gives the impression that there is something to hide. I usually stand pretty firm to the idea that soft tacos should have onions, cillantro, salsa to compliment the meat and tortillas. If a guacamole salsa makes an appearance for it to make the taco better it can't overwhelm the meat. But lettuce? Lettuce is a hard sell..I dont see any beneficial reason to add it to a soft taco. The asada was charred with some crunchy bits and combined with the subtle salsa roja it was enjoyable. The al pastor on the other hand wasn't passable. 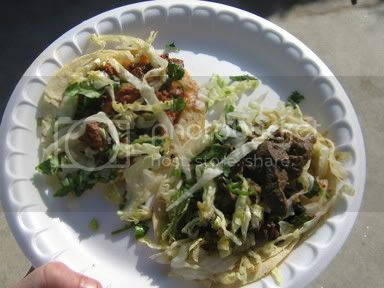 Too many gummy bits of pork and an overall lack of al pastor flavor left me wanting to just toss this taco in the bin. Overall I'm glad to have another mercado to shop for my tomatillos and chiles on the weekend. There are a couple other markets to shop at but the taco truck in the parking lot is the tie-breaker. I need some place to buy fresh tortillas on the west side. As close to La Cienega/Pico as possible. 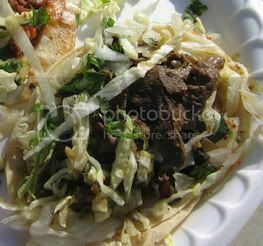 Surely there's a tortilleria somewhere the Pico strip between La Cienega and Crenshaw. Not that I've found. The closest is pretty far east (around Hoover or Vermont, I think). All the mercados that are closer are not much better than 7-11 with Jarritos. Actually, what I really want is something like the Northgate supermarkets in the OC and southeast L.A. 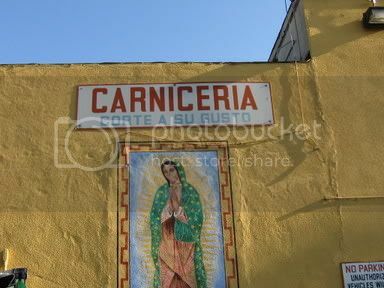 There's a great mom n' pop Carneceria my husband loves at our corner, Sawtelle and Washington Place, next to Jay's Liquor. They have a butcher shop and a little takeout place attached. He says it beats any place around us tenfold. not sure about the exact locations of tortilleria's unless you want to go to a Vallarta supermarket. I've seen tortilleria's around though. I believe there is one on pico between western and hoover. I remember I used to see it when I would take pico home from work and stop at the king taco on pico. You are talking about Don Felix right? Bandini, indeed I am talking about Don Felix! I admit, I am a vegetarian, but my husband loves meat. I'm usually happy with a bean burrito and rice (hey, we eat what we can.) I am always on the prowl for a good tortilla and fresh sauce. Your blog is fantastic; thanks for the comment about my humble website. I am about to move to Davis, California, where the tacos will be pretty bad. Luckily there's a truck in a nearby town that promises much.